WHY IS MY AIR PLANT DYING? Your Air Plants Got Problems? If you are wondering how to keep your air plant alive, I’ve got your back. Dying air plants can be discouraging. This frustration is compounded when we’re not sure why. By identifying the problem we’re halfway there, prepared to prevent future problems. Let’s begin with an air plants’ biggest vulnerability: rot. If water is allowed to accumulate in the cup, down inside the center of the plant, it can cause rot. If this is the case, you will notice a purple, or black color at the base of the plant indicating that rot has set in. The bad news is that rot is fatal. The upside is that rot is 100% preventable. Here’s how: After soaking in water, set the plant on its side or up-side-down for about 4 hours while the air plant dries. 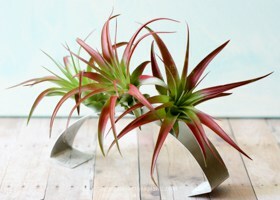 This will allow excess water to trickle away from the air plant, rather than pooling inside. Wait until the plant is completely dry before returning to its display. Tip: Overwatering Air Plants: Worry less about overwatering an air plant and worry more about letting the water drain away from your plant after watering. After the plant has dried, about 4 hours, return it to its display. Remember that air plants do not absorb water from their roots. Never display an air plant where water will accumulate. The platform for displaying the air plant must be completely dry; whether it’s rocks, or pottery, sand, or in a terrarium, it must be dry. After watering, allow the air plant to dry on its side or up-side-down. This will prevent rot. The opposite scenario is dehydration. The most prevalent misconception about air plants is that they will absorb all the water they need from the air. They are often marketed as completely care free. While air plants are very easy to care for, they do have 3 very important requirements: air, light and water. To hydrate your air plant soak it in a bowl of water for several hours once a week. Make sure that all the leaves are completely submerged in the water. Then, as discussed above, allow the plant to dry before returning to its display. 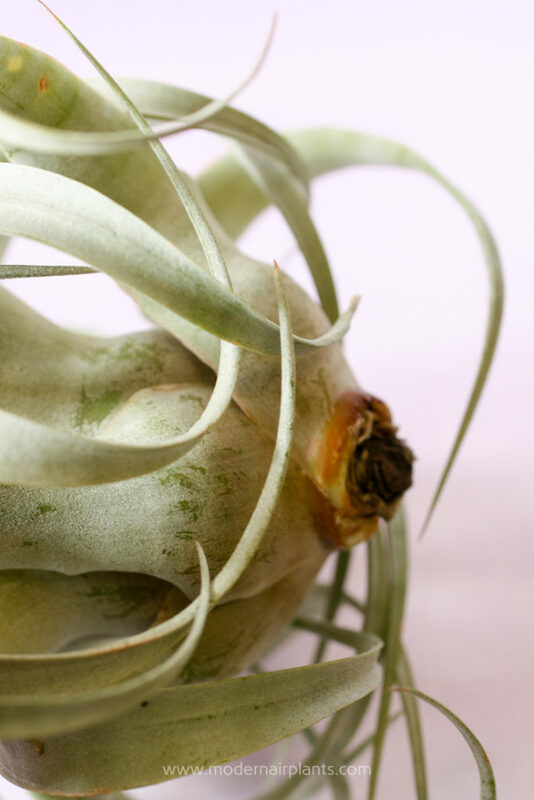 Perhaps your air plant is reacting to toxins such as copper, boron, iron, zinc or rust. First, check your air plant display. Is your air plant exposed to copper wire, pressure treated wood, rust? Second, are you using fertilizer? Copper, boron, iron and zinc are all common elements found in fertilizers. To avoid these toxins, use a fertilizer specifically formulated for bromeliads, tillandsias, or air plants. Another consideration is fertilizer burn. As recommended above, use a fertilizer made just for air plants to avoid metals that are good for most other plants, but are toxic to air plants. While fertilizer can help tillandsias to grow faster and produce more colorful flowers, it should be used sparingly, only fertilize once per month, after watering. Fertilize only once a month after watering to prevent fertilizer burn. Tip: Identifying fertilizer burn: If your air plants look dry and crispy, with browning leaves, yet you know they are hydrated, they may have fertilizer burn. Because air plants decline slowly, it can be tempting to keep our plants in a location where light is insufficient. The best practice is to keep your air plants where they will receive bright, indirect sunlight, about 3-5 feet from a window. If you want to keep a display in a location where you know the lighting is lacking, rotate it to an ideal location for the majority of the time. Too much sun can also be a problem. Direct sunlight will cause your plants’ leaves to sunburn. Air plants in the path of direct sun will also dry out more quickly. Artificial lighting is acceptable. Just be sure the plants are near the source and that you cut the lights at night. 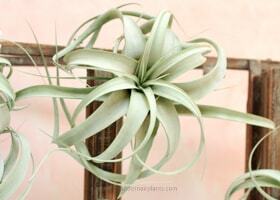 Another reason your air plant may be failing is poor air circulation. Lack of ventilation is most often seen in air plants that are kept in terrariums. If you want your air plants to thrive, an open-air display is the best option. Closed terrariums result in a stifling environment with condensation build up. On the other hand terrariums can be very pretty. Be aware that air plants kept under glass will not last as long and will need to be replaced. Good air circulation helps to moderate air temperature and prevents water from accumulating on the leaves. Don’t install a ceiling fan just for your air plants, but if you have one, turn it on a low setting during particularly hot or cold weather. By the same token a constant fan will certainly dry out your air plants. Avoid placing your air plants near heating and cooling vents. Even a touch of frost can be lethal to air plants. Keep your plants above 40 degrees Fahrenheit. If you keep your air plants indoors, this shouldn’t be a problem, but if yours are kept outdoors, be advised. If your air plants have been out in the cold and are now limp and mushy, they have probably been nipped by Jack Frost. Because air plants need bright light, we keep them near a window where they can also be exposed to very warm temperatures. In the summer, keep an eye on your air plants to make sure that if they do receive direct light that it is limited. Air plants will also dry out more quickly in hotter weather and may need more frequent watering. Speaking of watering, that is a good time to check for bugs. If you notice a cottony, web-like substance, you’ve probably got mealy bugs. These pests cover themselves in a waxy substance to protect themselves and then feast on the plant’s sap. Treatment: quarantine this plant from the others. 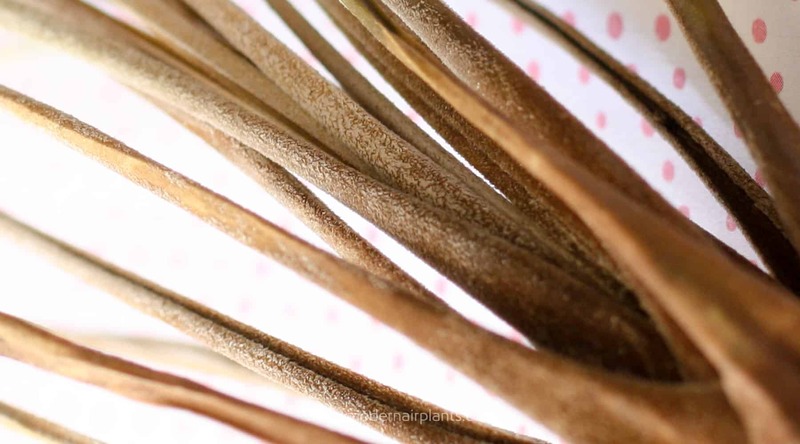 Then with a tablespoon of ivory dish soap diluted in a gallon of water wash your plant. With a cotton swab soaked in rubbing alcohol wipe in and out of every little crevice. Watch your plant for a couple of weeks for any signs of pests before returning it to its regular location. While prevention is the best medicine, we are all in the air plant experiment together. There is no teacher better than experience. Now you’ve got the tools for identifying problems. If one (or more) of your air plants has been fatally wounded, chalk that up to lesson-learned and keep trying. Mine looks like it has fertilizer burn. Can I save the plant? Orchids are very sensitive to being over fertilized. I would just hold off on the fertilizer, continue to care for your air plant and wait and see. Read your blog and it’s very helpful! I just got an air plant from a friend. It flew from California to Utah a couple weeks ago. I’ve been struggling to keep it alive as it’s already drying up with the leaves curled up. I’ve given a bath a couple time and it seems not to work. Is it because of low humidity and dry air? Please advise. As a fellow Utah air plant grower, I can tell you that you can successfully grow air plants in our arid climate. I do use a humidifier because our air is so dry. I turn the humidifier to the lowest setting and water my air plants about once a week. The key is to start with healthy air plants. I’ve found that maintaining healthy air plants is actually pretty easy, but once they have been compromised they become fragile. A couple of other tips is to make sure that the plants drain and dry upside down after watering and use tepid water to soak your air plants. I just got a xerographica and the base is a bit soggy. I removed a couple leaves. The base is yellowish and sticky. The little root nub is brown and I can move it around and push it in a bit. Is it rot? The good news is that black-ish and brown-ish bases are sure signs of rot – yellow is not. The best thing to do now is to make sure that after you water it that you turn it upside-down so the water will drain out. Hey! My girlfriend got me an air plant a few weeks ago because she knew I wanted to start taking care of plants, but I think I’m killing him and I can’t tell if I’m over or underwatering him :'( I don’t want to tell her I killed him in less than a month… is there any way I could send you a picture of Arthur to diagnose? Sure – send me a picture of your air plants – email me at [email protected]. A couple of quick tips. The most important part of care is to properly drain them after watering. This will keep water from settling inside the plant and rotting it. Also, be sure that the plants have plenty of good, indirect light. Last, air plants will do best if they are out in the open air – rather than in an enclosed terrarium. My plant is hanging in a wire case. it started with a beautiful pink flower than has now turned green/yellow… I live in a hot and humid country (Philippines). If these are like orchids… I spray mine 2x day. Is this okay? Will it be better off with a weekly 1hr soaking and drying process? I recommend soaking your air plant for about 20 minutes and then allowing it to drain and dry for several hours. However, because it is so humid you may only need to soak your air plants every 10 days or so. I have tillandsia bulbosa and it is turning brown and the base is brown the leaves are turing black in the center of the plant, please help I need to know what I need to do ?? I hate to tell you this, but the black at the center is a sign of rot. It is likely that the plant will die. But, don’t get discouraged. In future, remember to allow your air plant to dry thoroughly and to add a few more days between watering, and perhaps to soak for a shorter time. All the best – you can do this! I just got a greentillandsia caput medusae with red stripes today few base leafs-2 by the roots fell off but is healthy. Got as an wire stung xmas tree ornament. Had to reboot string it after it cause 3 leafs to fall off had to water it because of winter chill but good. Any advice about when it grows pups? T. caput-medusae is a favorite air plant variety. I have found them to be quite hardy and easy to care for, plus their long, unusually shaped leaves make them especially interesting. I have found that they produce pups rather easily. 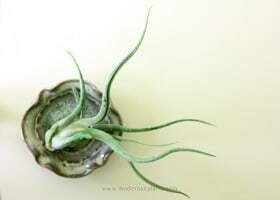 Give your air plant good, indirect light, plenty of airflow, soak it in water and allow to dry thoroughly and your T. caput-medusae should be a happy, healthy plant. No guarantees on the pups, but I am crossing my fingers that they will come. Proper care is the most you can do to encourage the pups. Once the pups have grown a few inches you can easily remove them from the mother plant. Just firmly grip the plants and pull them apart. Another option is to allow the air plants to form a clump. To do this all you have to do is nothing- leave the mother and pups growing together. I am not sure what is wrong with my plant! It was big and beautifully green and now it’s dry and brown and looks like it’s dying. The center is still green though. I thought it needed more water but that is not the case. I don’t know what else to do. Please help!! Most likely your plant has not been sufficiently hydrated. Be sure to soak your air plant about once a week for about an hour. After soaking, allow your air plant to dry up-side-down before returning to the display. Also, make sure that your plant is not getting too hot in a glass display. It is good that the core of the plant is still green. If the plant recovers it will be due to new leaves. Once leaves have turned brown, they will not green up again. I wish I had better news. Don’t give up! It is good that the spots are not at the base of the plant, which indicates rot. Also, it is curious that the dark spots seem to be spreading. If your air plants are close to a hot window, or in a glass container that receives full sun, the air plant could be getting too hot and burning the leaves. If the spots appear brown and dry, it could be due to fertilizer burn or underwatering. If it is the outer leaves with the dark spots, you could carefully remove them. to fully hydrate your air plant, be sure to soak your air plant in water for about an hour once a week and then allow to dry upside-down for at least 4 hours before returning to its display. About the pups: give it time. If you don’t see any pups, this may be a sign that your plant is stressed. Likely due to either too much or too little light or water. Let me know if you see any pups and if the back spots continue to grow. 1st attempt – I did not mist it, except for once a mth. The leaves fell apart and it died. 2nd attempt- I mister it twice or thrice a week. It rotted and died. 3rd attempt – I misted it once a week. After misting I let it lie horizontally for about 2-3 hrs to dry up. The leaves fell apart and it died. Hope you can give me some insights what I did wrong. Thanks . I’ve got a brand new Tillandsia xerographica friend, and I was wondering if brown-tinted leaves at the bottom of the plant are normal. It just came in the mail, and I watered it last night so I don’t think it’s that, but I’m still slightly concerned. It also is proving hard to completely dry out, since its leaves are scoop-shaped towards the base. Any tips on keeping my new friend happy and healthy? Contact the seller right away describing the brown-tinted leaves. 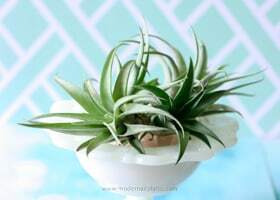 To dry the xerographica after soaking, set the air plant upside-down for several hours so that the water can drain away from the plant. Overall, I have found these to be hardy and rewarding air plants to grow. Their size and leaves really make a statement. Thanks for reaching out to me. I’m so sorry for your loss! I’m guessing that the pup that fell apart had some water trapped at its base. Growing air plants from seed is pretty tricky. It takes a lot of time (years), but does produce very healthy specimens. 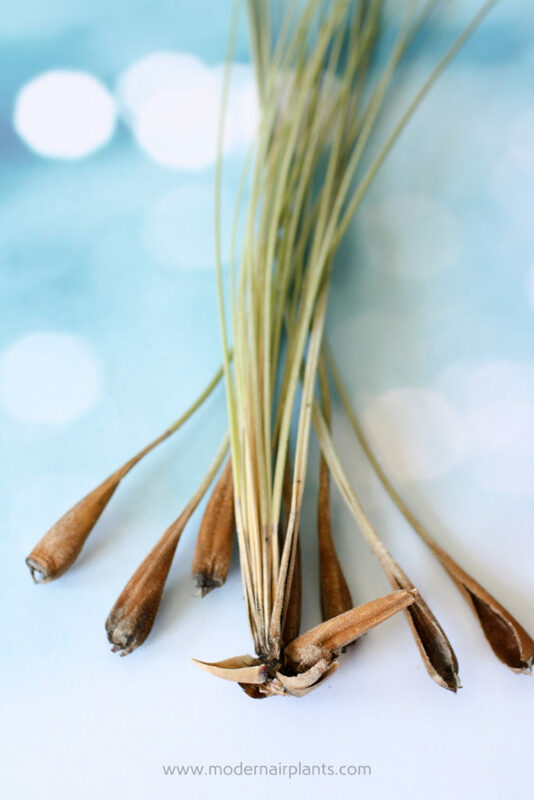 I’ve never grown air plants from seed – I’ve only read about it and it sounds pretty intense. As for the struggling pup, you’ll just have to wait and see if it makes it. After watering make sure that the water drains away from the plants. My air plant is glued to a piece of wood at the base. I bought it that way. Is it ok to leave it like this or should I remove it from the wood? If I need to remove it, how should I go about this? You can leave the air plant glued to the wood. Click on the link below to learn how to water air plants that have been glued to their display. 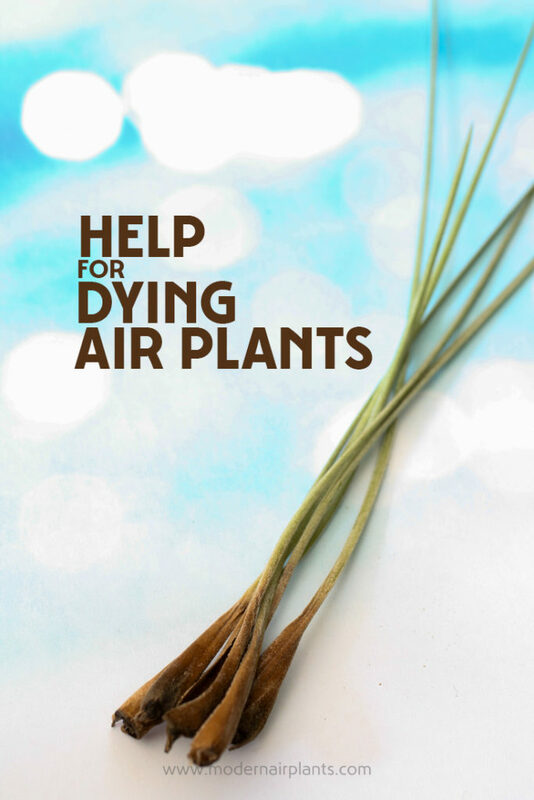 The guide for watering mounted air plants is near the end of the post. I think I cut too much off the base. My airplant was extremely dehydrated. I read up on several articles and they all had the same response: Trim the dead roots/base and soak over night. The airplant was glued to a skull, I carefully detached it completely and removed the dried black/brown roots & leaves. The plant is currently green, just feels like too much of the base is gone, no roots ): Can roots still grow? Or did I just kill my airplantIm hoping there are little baby roots in side that will eventually grow out. The good news is that the roots are in no way life-sustaining to the air plant. So, if you’ve only cut off roots (and the plant wasn’t too dehydrated) your air plant should be fine. If you cut off the base, in addition to the roots, only time will tell. I had 5 air plants on a wooden base, so beautiful I loved them. I cared for them well for a year, I lost one of them because of lack of sunlight, it was at the bottom of the wooden base and wasn’t getting enough sunlight, so i was left with 4. Recently my in-laws moved in a took over the responsibility of watering it and I lost 2 more to rot. They watered it well but the plants weren’t getting enough sunlight too. So the water just accumulated in the base and the plants died due to a rot. I guess they weren’t dry enough and the rot set in. I just felt like crying when I discovered it 🙁 I feel guilty that I didn’t care for it and they died because of that. I would love to go back and take care of them. But I’ll get some more and make sure they’re well. Thanks for sharing. 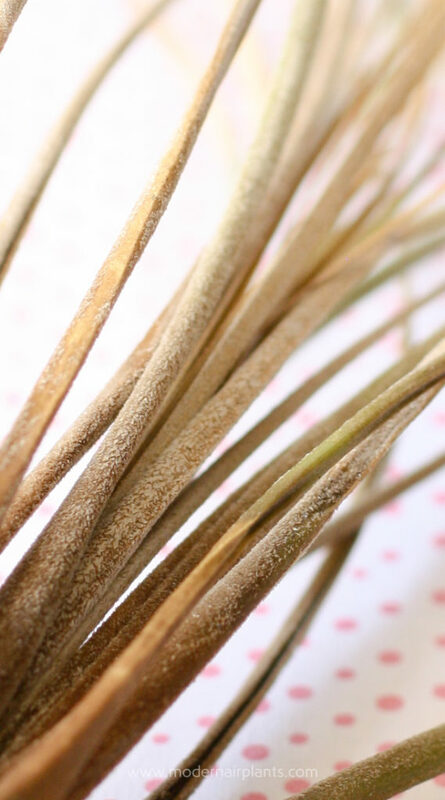 Yes, rot caused by water accumulating in the air plant and lack of sunlight are two common causes of air plants dying. But, don’t give up! Try again. Growing plants is always an experiment. Question: How can you tell the difference between symptoms of overwatering and under watering? One of the leaves near the base of my air plant fell off and i noticed it was a brownish black color at the base of the leaf. I also noticed a couple very small spots of a brownish color on two leaves at the very bottom as well as one of the bottom leaves shriveling. The plant does not have any black coloring at the bottom and no leaves from the center or loose or coming out. I can’t tell if I should be watering my plant more or if it’s rotting. Me too! Let me know if you have any questions! Thank you for the info. I think my plant is doomed, it completely shredded from the root into pieces. But I learned a lot of things not to do that I did, thank goodness I have more than one. You’re the best Anna ? It’s such a disappointment when that happens! Once that happens there is really nothing that can be done–except try again. I’m glad you’re not giving up! Let the plant drain well after soaking. Let me know if I can help. It is not unusual for the plant to be hard at the base, but shredding is unusual. I wonder if the plant sat in water or didn’t drain well after watering. My advice is to be sure that the plant is displayed in a dry environment. Also, allow the plant to dry up-side-down for about 4 hours before returning it to it’s display. My air plant has a Orenge jelly like substance on the bottom of it… what is it? I have never heard of this before. Will you send a picture? Question: how can I save a crushed air plant? Oh I’m so sorry to hear your air plant was crushed! If the plant will survive long enough to flower, it will produce one or more babies. These babies will be whole and undamaged. Once the pups, or babies, are about 2-3 inches long you can remove them from the mother plant. In the meantime, be extra gentle with the plant, continue to care for the plant, and hope that it will soon flower. Air plants only flower once, so if it’s already flowered, you won’t get any more off-sets. I love that you named your air plant!